A kleptomaniac cat notorious for stealing items from its neighbours has "finally brought home something of real value" - £25.70 in cash. Pilfering puss Theo became known for thieving Christmas decorations and toys in Ipswich, which owner Rachael Drouet would then try to return. She had joked it might be useful if he brought home cash instead of "tat". So he did. The eight-year-old Siamese cross stole the money a neighbour had left out for the milkman. Ms Drouet and her family recently moved to a new house in the town and thought Theo might have left his thieving habits behind him. Far from mending his ways, the filching feline upped his game and stole a plastic bag containing the cash. Luckily there was a note inside with an address, and Ms Drouet's partner Paul Edwards was able to return the money to their neighbour. 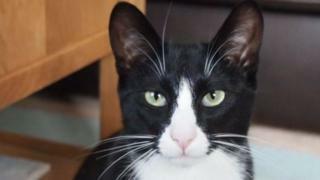 "He explained we have an Asbo cat," Ms Drouet said. "The young lad smiled, took the money and acted like that kind of thing happened all the time." Mr Edwards said it had been a "great way for me to introduce our cat's behaviour to the new neighbours". The couple said: "Stern words [were] had with Theo - he said he thought it was his old favourite - an empty charity bag. "Mistake pointed out, he was full of apologies." Cat biologist and behaviourist Roger Tabor said cats often brought home "trophies" but this was usually food scavenged from bins. "The real cat burglars are those that regularly bring back an assortment of human-associated objects," he said. This could be because they were not taught by their mothers to catch live prey, he added. "Without the normal learning interactions of a mother or other kittens, they have become particularly fixated on 'toys' and continue to hunt them."